I have the Logitech R400 Laser Presentation Remote and I love it. So when I noticed that the R500 was released I looked for an excuse to get one. Unfortunately, since the R400 is so good, I had a really hard time of coming up with an excuse, until I was driven to the brink of madness by a user who doesn't know the difference between "press" and "hold". Whenever I let others borrow my R400, they have a really difficult time of figuring out all the buttons. It's just not obvious for some people that the right-pointing arrow button with the bump on it is the next slide button, and the left-pointing arrow button is the previous slide button. And let's not talk about the start/stop slide button and the blank screen button. And with all the keys placed close together they keep accidentally pressing the wrong button and gets totally lost and confused. And as mentioned above, what always drives me crazy is that I like to set my key repeat rate really fast, and they often press and hold the next slide button and end up on the very last page then exits the presentation. Gah! The R500's three separate, giant buttons really helped with the wrong button problem. The huge button with the right-pointing arrow is instantly obvious that it's for going to the next slide. And to my greatest surprise, the R500 no longer has the repeat button problem. Powerpoint slides will only change when the change slide buttons are pressed and then released. It doesn't change immediately when the buttons are pressed, but rather changes when the buttons are released, and if you realize you made a mistake or changes your mind about changing slide, just keep holding down the button and the press will be canceled. (Note: not true, see paragraph below.) No more accidentally going through multiple slides with a long press. I feel a lot of thought must've gone into designing this feature and after using it for a few minutes it became second nature to me. Unfortunately, as I'm writing this I have a bad feeling that the users will be confused again, especially since the slide change action happens at button release rather than button press. One other difference is that the R400 sends out PgUp/PgDn keypresses to the computer, while the R500 sends out Left/Right keypresses. A side effect of this change is that when using the R400 to change pages in PDF documents, in can scroll until the very end. The R500 couldn't page down to the very end since the Left/Right keys only changes pages but won't scroll to the very end like PgDn does. Oh, since the R500 has less physical buttons, the start/stop slide and blank screen functions can only be enabled by installing a driver (Windows / MacOS only) and holding down buttons. But I think for most users the driver installation would be unnecessary and press and hold will only confuse more people. Ooh, I just realized what I wrote above about holding down a button to cancel the press is actually hold down for second function. Yeah, I'm totally sure that so many people will be confused by this. Therefore, installing the driver is totally not recommended. 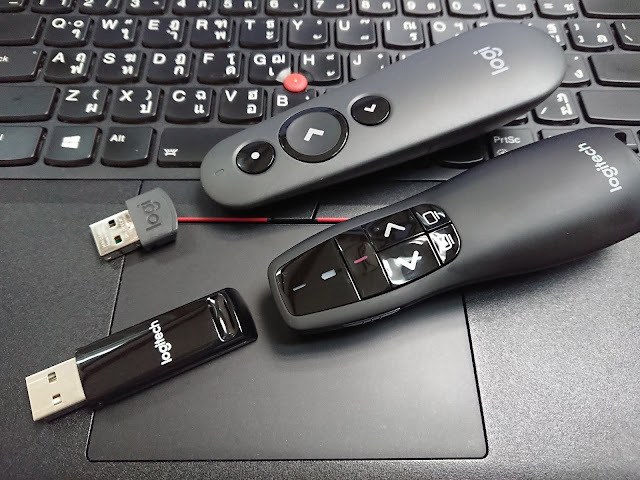 Even though the USB dongle is now tiny compared to the one on the R400, the R500 supports Bluetooth connectivity which is a really nice plus for computers that no longer have standard USB ports (Macbooks) or for mobile phones. Reviews on the net says there's frequent disconnect with Bluetooth but I had no such problems. Another change is the R500 uses a single AAA battery vs. two on the R400. Probably shorter battery life. Oh, and no power switch on the R500, so if you leave it in your bag, accidental presses could shorten battery life. Another tiny difference is that the laser on the R500 is "less stable" than the R400's. Probably not noticeable for most people, but I noticed with cheap laser pointers or low powered laser pointers, the laser point tends to flicker or drift, and the R500 does this, but as I said, not really noticeable and most people probably can't hold the remote that steadily anyway. The one drawback I found is that the R500's plastic body and buttons feel really cheap. I don't really care for so called "premium" leather body products, but the R500 just feels cheap in the hand. As for the buttons, if I have to make a comparison, it's as if the R400 has high quality laptop style keyboard keys, while the R500 has cheap calculator keys.